For people that are Titanic enthusiasts, the news that Australian billionaire Clive Palmer, was going to make their dreams come true. Back in 2012, Palmer claimed he was going to built the infamous ship, and it would be setting sail in 2016. However, since that time, Palmer has done absolutely nothing to get the ship built, not even signed contracts with the Chinese shipping yard that was supposed to handle the construction. However, all hope is not lost because Titanic enthusiasts can still get to experience what it is like to be on a replica of the most famous ship in the world. There will be a Titanic replica that will be built in China, and it even has tentative date of October 2017. The tickets to go on this Titanic replica actually go on sale today, June 15th in Hong Kong. However, what people may not understand is that this more than just a replica of the most famous ship ever, but also an amusement park ride. One thing that people are often the most curious about is what it was like to be on the grandest ship in the world at the time of its launching. There are some Titanic museums that offer a once-in-a-lifetime dining experience using the same menu that was served on the last night of its voyage, but is that really the same thing as eating on the Titanic? The answer is no, but now that the Chinese have spent over $161 million dollars on their Titanic replica, they can offer passengers the change to re-live the entire Titanic voyage. When the RMS Titanic launched in 1912, passengers in First Class paid close to $5000 dollars in modern dollars for the passage from Southampton to New York City. These First Class men and women wanted to experience only the best, and they paid a hefty price to ensure that they did. 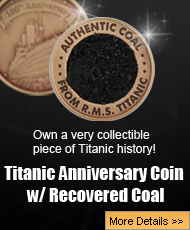 So what is the price of going on the Titanic replica? A lot more affordable than close to $5000 dollars! For less then $500 dollars a night, and with that price, passengers get the full Titanic experience from the extravagant dinners, to dancing to a live band just like the passengers did back in 1912. For those that truly want to go First Class, the price is much higher for the luxury passage, which is around $16 thousand dollars, people can be at the height of luxury, which is still more affordable now than it was back in 1912. To ensure that everything is as authentic as possible, everything is replicated perfectly, right down to every single nail, screw, nut, and bolt in the replica ship. How authentic is everything? 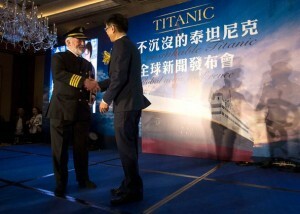 The Chinese asked James Cameron’s staff, who helped with the ship recreation, to check over their concept sketches, and the team behind the Oscar-winning 1997 movie, Titanic, gave it a thumbs up for authenticity. Talk about getting the seal of approval from the experts! While some people are excited about the prospect of experiencing the Titanic voyage, and some of its sinking, not everyone is thrilled at the idea of this new ship. Some people have called the idea of a replica ship being launched, and part of the sinking taking place, an insult to those that actually lost their lives in the real sinking. Perhaps, the idea of this replica ship being billed as almost an amusement park ride, is not the best way to put it, but does that matter concerning that people will actually get to stay on this ship and experience things that the real passengers got to experience? 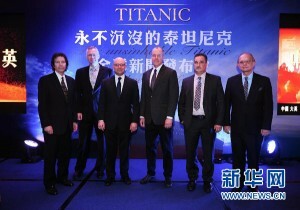 The tickets for the Titanic replica are on sale in Hong Kong, and the ship itself will be ready in October of 2017. For those that want to see Titanic sale again, this is great news, but others do not share the enthusiasm. For a more reasonable price than what was offered in 1912, Titanic passengers can experience what the passengers did, and of course, for the full First Class experience, the price is a lot higher. Will this Titanic replica be a success or will it too sink to the bottom of the North Atlantic along with its predecessor? Only time will tell whether the Chinese have struck gold with this replica, but it will be interesting to see exactly what does happen in October of 2017 when the Titanic replica is ready to set sail!